The watercolor by the English artist Henry Moore is work on paper, It measures 12×9.5 inches. The image is of a three different sculpture studies. This work on paper is part of the Farhat Art Museum collection in the Modern Masters collection. A sculptor of large-scale, abstract figurative work with voids or pieced areas, Henry Moore was a revolutionary figure in bringing modernism to the sculpture mediums of marble and bronze in Great Britain. His home and studio were in Much Hadham, England. Henry Moore was born, the seventh of eight children in Yorkshire in the mining town of Castleford. His father was a mining engineer who loved music and literature, and emphasized the importance of education to his children. At age eleven, Moore determined to become a sculptor, and the decision was reinforced when he became familiar with the work of Michelangelo. However, his parents opposed that decision because they perceived sculpture as being more manual labor than art expression. Their observations were likely reinforced by the fact that many of his early pieces resulted from direct carving, which took much time and which allowed natural markings on the material to be part of the sculpture. Moore served in the army during World War I, and injured with gas, spent the rest of the war doing physical training. In 1919, after the War, he received a grant for ex-servicemen and enrolled as the first sculpture student at the Leeds School of Art. There he began a life-long association with Barbara Hepworth, who also became one of England’s most famous modernist sculptors. He was also exposed to African tribal sculpture, and in 1921, enrolling at the Royal College of Art in London, gained more knowledge on primitive sculpture. He spent much time in the ethnographic collections of the Victoria and Albert Museum and British Museums. In 1924, he studied in Italy on a six-month traveling scholarship. Returning to England, he took a teaching position at the Royal College of Art and married a Russian-Polish girl, Irina Radetsky, a student at the College who posed for Moore. They lived in Hampstead and were neighbors of Barbara Hepworth and her partner, Ben Nicholson. In the 1930s, Moore joined the faculty of the Chelsea School of Art, and became chair of the Department of Sculpture. He became increasingly active in modernist art, experimenting with Surrealism, Cubism and other progressive movements, but World War II ended much of his experimentation because he was a commissioned war artist. He did many drawings showing Londoners hiding in the London Underground, and the power of these depictions brought him much attention beyond his own country. Because their Hampstead home had bomb damage, the Moores moved permanently to a farmhouse in Much Hadham in Hertfordshire. 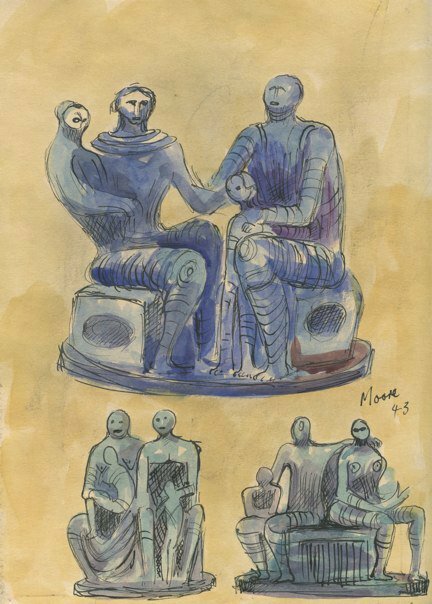 Although he made much money from the success of marketing his sculpture, Moore lived frugally and gave most of his money to the Henry Moore Foundation, established to support fine-art education and promotion through the Henry Moore Institute in Leeds and to preserve his sculptures. The Foundation also helped him avoid taxes, amounts that were over a million pounds a year by the end of the 1970s. In 1946, the Moore’s had a daughter, Mary, and this event combined with the recent death of his mother focused the sculptor on the subject of family, especially women. As a result, many of his sculpture subjects are family groups such as mother and child or reclining figures, usually female. In 1946, Moore also made his first trip to America, where the Museum of Modern Art held an exhibition of his work. Two years later, he won the International Sculpture Prize at the Venice Biennale*. In 1951, he declined the offer of knighthood, but in 1963, received the Order of Merit. He gave his work simple titles such as The Arch or Oval with Points because he believed that an artist should not overly explain his or her work but should leave enough unsaid that an air of mystery would surround the piece. His working method in the 30’s was to make many preparatory sketches and drawings, and in the 1940s to do most of his preliminary work with clay modeling instead of on paper. Following World War II was the period when he did most of his huge works, which were done to accommodate the many public art commissions he was receiving. At that time, he had studio assistants, including Anthony Caro and Richard Wentworth, who worked from the “maquettes” he created, some of them very small and others half scale. In his studio, he created a collection of objects that provided ideas for his organic shapes—such as pebbles, driftwood and skulls. Increasingly he received commissions including for the UNESCO building in Paris in 1957. In 1967, to commemorate the achievement of the first sustained nuclear chain reaction by a team of scientists led 25 years earlier by Enrico Fermi, Moore did Nuclear Energy. It is twelve feet tall, and has been described as “a mushroom cloud topped by a massive human skull.” However, Moore said that people should “go around it, looking out through the open spaces, and that they might have a feeling of being in a cathedral.” Exhibitions mounted, and by the end of the 1970s, over 40 exhibitions a year featured his work. Henry Moore died August 31, 1986 at age 88 in his home at Much Hadham. England honored his reputation by placing his remains in St. Paul’s Cathedral. Sculpture by Henry Moore is in numerous museum collections including the Tate Gallery, London; Hirshhorn Museum in Washington DC; and Nelson-Atkins Museum of Art in Kansas City. 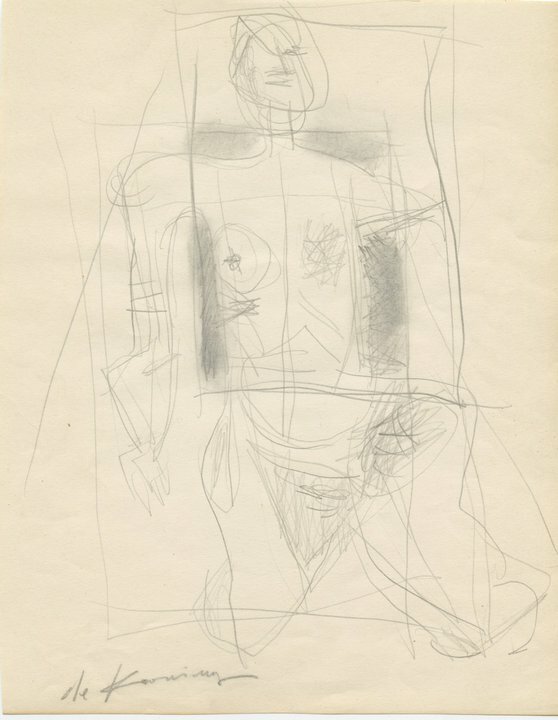 This figurative study work by de Kooning is a pencil drawing in paper measures 10×8 inches. It is part of the F.A.M collection of work on paper by the modern masters. Willem de Kooning was born in Rotterdam, Holland on April 24, 1904. His father, Leenert, was a wine and beer distributor who won custody of young Willem when his parents separated about five years after his birth. His mother, Cornelia Nobel de Kooning, ran a tough seamen’s bar, and snatched the boy back soon after. At the age of twelve, with elementary school behind him, de Kooning entered an informal apprenticeship with commercial artists and designers, Jan and Jaay Gidding, who also provided his art education. They enrolled him in night courses at the Rotterdam Akademie voor Beeldende Kunsten en Wettenschappen, where he studied academic art and crafts. His first jobs were in commercial art, including a year in Belgium during which he visited museums and studied. He came to the United States illegally in 1926 and settled in Hoboken, New Jersey, which had a large Dutch community, while he learned English. He began his career as a house painter. When he saw an ad in a New York newspaper for someone to do commercial artwork, he went to New York and for many years he did lettering, sign painting and carpentry. In 1935 he was employed doing murals for the Federal Arts project; the same year he did his first easel painting and his first independent commission was for part of a mural for the New York World’s Fair of 1939 and 1940. A series of black and white abstractions in the late 1940s were the subject of his first one-man show. He chose black and white for the simple reason that the neutral paints were less expensive, but the works were considered his best by many experts. In 1943 he married Elaine Fried, who was one of his art students. In 1948 they visited East Hampton as weekend guests of Jackson Pollock and Lee Krasner. De Kooning’s pride and joy was his studio, built between 1963 and 1969 to his specifications. He spent most of his day there. Besides hard work, his other pleasures were seeing movies and bicycle riding. He designed the huge studio with 30-foot ceilings, white walls and large expanses of glass, allowing all available light to pour in. Despite his quick American assimilation, de Kooning’s ties to Holland surfaced on occasion. It is significant that though in 1964 de Kooning was awarded America’s highest civilian award, the Medal of Freedom, he had remained a Dutch citizen for almost forty years after arriving here. The whole myth of American life, the vulgarity, the bigness, the overstatements, appealed to De Kooning. He could find inspiration in aspects of American culture that Americans tend to be repulsed by. He repeatedly told visitors that he had gotten the idea of mixing his colors from the ice-cream counter at Howard Johnson’s, where twenty-eight variously colored flavors were shown off in buckets. Like many artists, De Kooning had frequent periods of self-doubt while painting. A doctor friend told him to take a brandy in the morning; as a result, he became a drunk. His alcoholism contributed to the disintegration of his marriage and they separated in 1955. They never divorced and she remained his close friend and colleague. 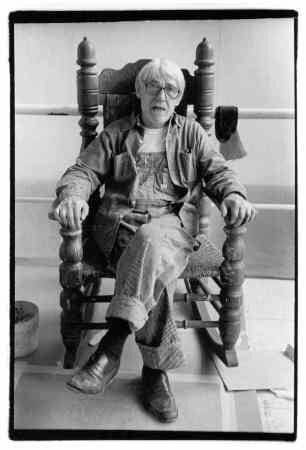 After the separation, DeKooning, who was always attractive to women, moved in with Joan Ward, a commercial artist. When De Kooning was fifty-two, their daughter, Lisa, was born. Three years later deKooning moved to Rome with Ruth Kligman, an artist’s model. But his alcoholic blackouts grew worse, interspersed with periods in drying-out wards, until 1978 when Elaine finally persuaded him to go to Alcoholics Anonymous. She secretly gave him a drug, Antabuse, that made him sick when he drank. By 1980 he was through the worst. The originator of a boisterous idea of painting-as-adventure, he had gotten lost in a haze of often violent alcoholism and was almost never able to paint. The period between 1978 and 1981 in a retrospective at the National Gallery of Art was represented by a single work. In the 1980s, however, a newly sober De Kooning suddenly became productive once again, although he also began to slide into what the doctors believe is Alzheimer’s disease. De Kooning used a variety of tricks to pump up the sensuously inviting tactility of his surfaces, including his famous wet-on-wet technique of mixing salad oil in the pigment, in order to make it slithery, fluid and receptive to sustained periods of work. It didn’t dry out fast. As he worked he would repeatedly scrape down the surface, leaving layered smears and traces of underpaint to show through, like insistent memories of past encounters piling up one on top of the other. His paintings can look slatternly, as if they’ve been around. He rarely painted either males or reclining figures. De Kooning’s circle of friends consisted either of old acquaintances of many years’ duration or people introduced to him by a trusted group of advisors who shielded him from exploitation. In this second category is former Beatle, Paul McCartney, whose wife, Linda Eastman, was the daughter of De Kooning’s lawyer, Lee Eastman. The McCartneys always came to visit when they were in East Hampton. Great artists have collided with mortality throughout history, but none has done it in quite the way that De Kooning has. His last paintings were those made between 1981 and 1990; then he laid down his brushes for good and became an invalid tended around the clock. He died on Wednesday, March 19, 1997. Dutch Master by Patrick Pacheco in Art & Antiques, September 1994 . Written and compiled by Jean Ershler Schatz, artist and researcher of Laguna Woods, California. The painting by W.P.Silva is oil on canvas board . 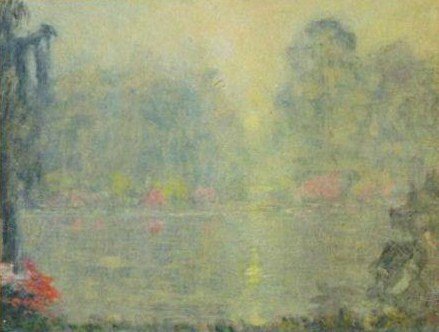 It measures 12×14 inches and the painting is part of the F.A.M collection of American impressionist artists. the subject is a view of a Garden in the southern Savanna Cypress Swamp, Cypress Gardens North Charleston South Carolina.